It has been apparent for more than a century that future economic progress in agriculture will be driven by the invention and application of new technologies resulting from expenditure in research and development (R&D) by governments and private firms. Nevertheless, it is conventional wisdom in the economic development literature that there is a significant underinvestment in agricultural R&D in developing countries. 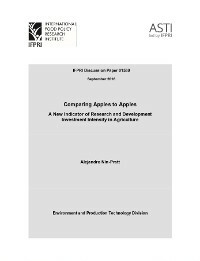 Evidence supporting this belief is provided, first by a vast literature showing returns on R&D expenditure to be so high as to justify levels of investment in multiples of those actually found, and second, from available data showing low research effort in developing countries as measured by the intensity ratio (IR), that is, the percentage of agricultural gross domestic product invested in agricultural R&D (excluding the for-profit private sector). This paper argues that the IR is an inadequate indicator to measure and compare the research efforts of a diverse group of countries and proposes an alternative index that allows meaningful comparisons between countries. The proposed index can be used to identify potential under-investors, determine intensity gaps, and quantify the R&D investment needed to close these gaps by comparing countries with similar characteristics. Results obtained using the new R&D intensity indicator with a sample of 88 countries show that the investment effort in developing countries is much higher than the one observed using the conventional IR measure. The new measure finds that countries like China, India, Brazil, and Kenya have similar levels of R&D intensity to those in the United States. To close the R&D intensity gap measured by the new index, developing countries will need to invest US$7.1 billion on top of the $21.4 billion invested on average during 2008–2011, an increase of 33 percent of total actual investment.